Simulated skills practice with a racing theme and high energy music. Every year in the United States more than 500,000 adults and children experience a cardiac arrest. Less than 15% survive. 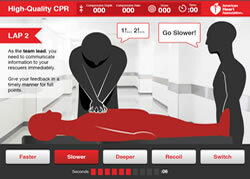 The American Heart Association hired Weejee to emphasize the importance of high quality CPR with an online game. Learners jump right into simulated CPR from the perspective of three roles: compressor, ventilator, and team leader. Points, timers and leader boards incentivize top performance.